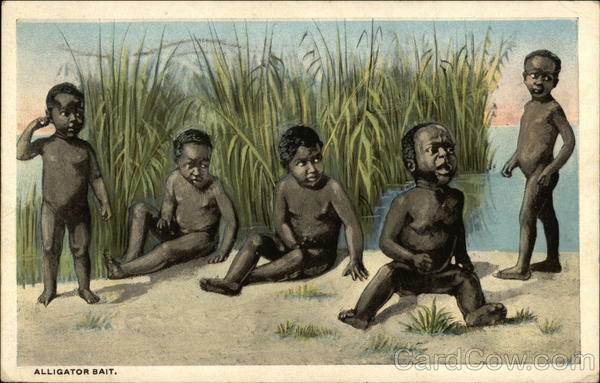 Alligator bait, also known as gator bait, was the practice of using infant black children as bait to lure alligators. It was done by white men during slavery in Florida and Louisiana, and other parts of the American South. In 1923 ‘Time magazine’ carried this story: From Chipley, Fla., it was reported that colored babies were being used for alligator bait. The infants were left to play in shallow water while expert riflemen watch from concealment nearby. When a saurian approaches his prey, he is shot by the riflemen. The Chipley Chamber of Commerce said the story was “a silly lie, false and absurd.” Maybe so, but it was widely reported in the American press, so it was at least believable among white Americans of the time. Language: Probably from at least the 1860’s up until the 1960’s “alligator bait” was a racial slur among whites for little black children. In Harlem in the 1940’s it was applied to blacks of any age from Florida. It is hard to process the thinking that could lead a person to use a live human baby as bait for an alligator. That is why the objects in the Jim Crow Museum are so important – they help tell the story of a society that defined African Americans as “sub-human” by portraying them as savage and worthless creatures (“Americans Forced”, 1944). If people are indoctrinated, repeatedly, with items, images, objects, and practices that devalue the humanity of African Americans, then practices like African Dodger, Human Zoos and Alligator bait become possible. In 1908 the Washington Times reported that a keeper at the New York Zoological Garden baited “Alligators with Pickaninnies” out of their winter quarters. In the article two small colored children happened to drift through the reptile house among the throng of visitors and they were pressed into service. The alligators wobbled out as quick as they could after the ebony mites, who darted around the tank just as the pursuing monsters fell with grunts of chagrin into the water. The alligators were coaxed into their summer quarters as plump little Africans, Baits Alligators. In Florida during slavery, slave-owners would take an enslaved black child, tie a rope around his or her legs, put them in the water and use them to lure Alligators as bait. In 1900, two movies ‘Alligator bait’ and ‘Gator and the Pickaninny’ both depicted this atrocious crime. The headline in the September 21, 1923 Oakland Tribune reads: “PICKANINNY BAIT LURES VORACIOUS ‘GATOR TO DEATH. And Mother Gets Her Baby Back in Perfect Condition; Also $2″. Villiers is quick to point out that the babies are brought out of the water alive and whole and come out wet and laughing and that “there is nothing terrible about it, except that it is spelling death for the alligators. The article describes the process of placing the babies near the alligator’s haunts, with the hunters hidden behind the brush with their rifles. When the baby “attracts” the gator and it exposes his head and forequarters, the hunters shoot the gator and claim their prize. And, just in case someone happens to care about the welfare of the baby, the reader is assured that Florida alligator hunters do not ever miss their targets. After the baby is returned to its mother, she is paid the set price of two dollars (Villiers, 1923). This is, of course, fabrication. Slaves couldn’t read so they couldn’t possibly answer an ad about using their children for alligator hunting. There was also no reason to ever pay a slave for using their babies as alligator bait. “The slaves who had babies, they would steal the babies during the course of the day, sometimes when their mothers weren’t watching… Some would be infants; some would be a year old; he said some would be toddlers. He said they would grab these children and take them down to the swamp and leave them in pens like little chicken coops. They would go down there at night, take these babies and… tie them up, put a rope around their neck and around their torso, around here, and tie it tight.